Sunday’s STP 500 Monster Energy NASCAR Cup Series race at Martinsville (Va.) Speedway will be Kyle Busch’s 1000th start across NASCAR’s three national Series (Cup, Xfinity and Gander Outdoors Truck). Busch is in his 15th season of full-time competition in the Cup Series, and he also continues to run partial schedules in the Xfinity and Truck series. His career-start 999 Saturday, the TruNorth Global 250 Truck Series race at Martinsville, resulted in his 201st national win across all three series. Fifty-three of those wins came in the Cup Series. Busch is the all-time winningest driver in the Xfinity and Truck Series, with 94-career Xfinity Series wins and 54 victories in the Truck Series. Busch claimed his Cup Series title in 2015 after missing the first 11 races of the season, sidelined by injuries sustained in the Xfinity Series season opener at Daytona (Fla.) International Speedway. 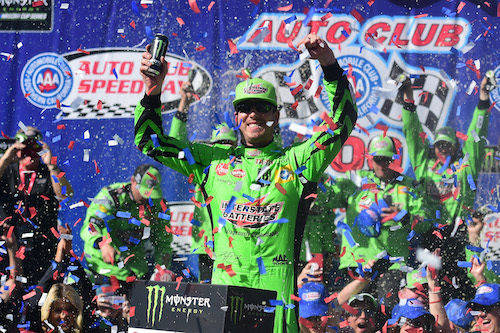 In his first 999 national races, Busch’s winning percentage over all three series is just over 20 percent, with a personal best single-series winning percentage of 36 in the Truck Series. To this point in his career, he wins just over 10 percent of the Cup Series races he contests. After six Truck Series starts for Roush Fenway Racing in 2001, Busch was sidelined until 2003 when he joined Hendrick Motorsports. He joined Joe Gibbs Racing in 2008 and has been there ever since. His Xfinity Series efforts also are with JGR, while he fields his own Truck Series entries through his Kyle Busch Motorsports.